A study found that consuming two eggs per day was linked to a 27 percent higher risk of developing heart disease. But many experts say this new finding is no justification to drop eggs from your diet. Part of the renewed appeal stems from the dietary advice we got back in 2016. That's when the U.S. Dietary Guidelines dropped a long-standing recommended limit on dietary cholesterol. The move was seen as a green light to eat eggs. But a new study published in the medical journal JAMA reopens a long-standing debate about the risks tied to consuming too much dietary cholesterol. "What we found in this study was that if you consumed two eggs per day, there was a 27 percent increased risk of developing heart disease," says researcher Norrina Allen, an associate professor in the Department of Preventive Medicine at Northwestern University. "It was surprising," Allen says. The researchers behind the JAMA study tracked the health of about 30,000 adults enrolled in long-term studies. On average, participants were followed for about 17 years. Prior studies have come to competing conclusions. But overall, there has not been strong evidence that limiting consumption of cholesterol-rich foods lowers the amount of artery-clogging LDL cholesterol that ends up in our blood. Nutrition experts at the Harvard T.H. Chan School of Public Health conclude that dietary cholesterol and cholesterol in the blood are only weakly related. But Allen says that "we don't know as much as we'd like to about how the cholesterol you consume in your diet is translated into the blood." One shortcoming of the study is that participants were asked only one time about their diets. So, this one snapshot may not have accurately captured their eating habits over time. "We hope that in future studies we can look at how changes in diet over the long term may be impacting this risk for heart disease," Allen says. Future studies could also explore how the risks linked to dietary cholesterol may vary from person to person. 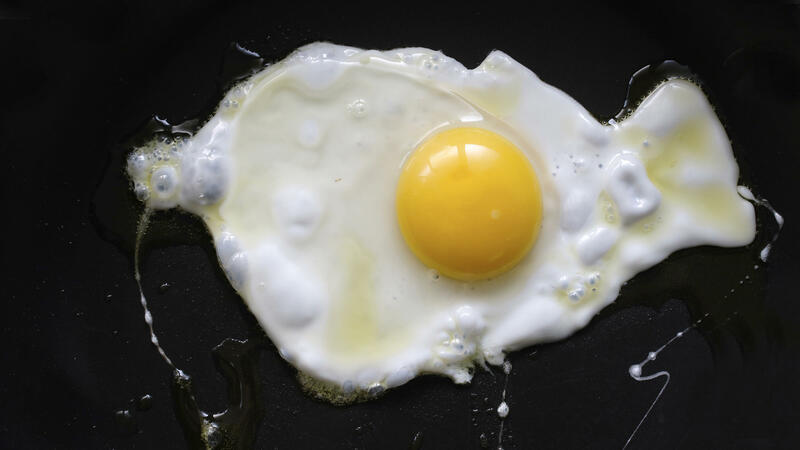 Big picture: Many experts say this study is no justification to drop eggs from your diet. "So much data have already been published on this topic, which generally show that low-to-moderate egg consumption (no more than one egg per day) is not associated with increased risk of heart attack or stroke," Frank Hu, a professor of nutrition and epidemiology at the Harvard T.H. Chan School of Public Health, said in an email. Hu says that when it comes to healthful eating, the best strategy is to focus on a well-rounded diet that includes a variety of foods such as fruits, vegetables, whole grains, nuts and seeds. Thomas Sherman, a professor at Georgetown University's School of Medicine, agrees. "I tell my students that eating a protein-rich breakfast is one of the best ways of preventing getting hungry," Sherman says. "So I'd hate for them to come back to me and say, 'Oh, no! We're not supposed to be eating eggs.' "
Sherman says if you're in the habit of eating a healthy diet, full of lots of plant-based, fiber-rich foods, then "eggs are a welcome part of the diet." Just don't overdo it. But the findings may reopen the debate about whether to reinstate a recommended limit on dietary cholesterol. A committee of experts was named this year to begin the process of revising the U.S. Dietary Guidelines. And Allen says, "I do think that guideline committees will have to take the evidence [from this study] into account when they're trying to understand what a healthy — or a moderate — amount of cholesterol would be."